Katniss and Peeta made a mistake. Sure they were able to both stay alive, making Hunger Games history last year. But their rule breaking, particularly on Katniss' part, has brought down the hard fist of the Capitol upon them. Even President Snow has made threats to Katniss, mainly centering around killing her family and friends...friends that seem to shut her out. Gale reveals his true feelings for Katniss while seemingly pushing her away, confusing her even more, as Peeta keeps his distance while reminding her she is everything to him. All Katniss wants to do is escape into the woods, but with the Capitol threatening all she holds dear, she must figure out how to make things right. While she tries to undo what she did to win the Hunger Games, Katniss and her mockingjay pin become symbols of small rebellions that are rippling through the districts in Panem. The Capitol is not happy with these small acts of defiance, putting more pressure on Katniss. In an attempt to appease the President, Katniss must find a way to convince him and the rest of Panem that she is still blissfully in love and on the fast track to happily-ever-after with Peeta. As hard as she tries, Katniss' tendency to wear her true emotions on her sleeve doesn't convince the President of her affection. As the 75th annual Hunger Games begins, there is devastating news in the form of the Quarter Quell, which happens every 25 years in the Hunger Games. Katniss must decide what is most important and what is worth fighting for. 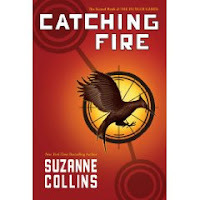 I was lucky enough to get my hands on an advanced copy of Catching Fire from one of our librarians who went to BookExpo America. The actual novel doesn't come out until September 1, 2009. This gives all of you plenty of time to read The Hunger Games, which I heartily recommend for anyone: guy or girl, teen or adult, romance or sci-fi lover. The Hunger Games is, as one of my coworkers put it, crazy addicting. I have to say that book two, Catching Fire, is just as obsession worthy. If you want to find out more about The Hunger Games then read The Ninja Review of it. I am dieing to read Catching Fire!! !